The Whitman iMBA brings a world-class business education to you, on your terms. This innovative online MBA program is designed to advance your career by providing the global business acumen you need, no matter where you live. Blending on-campus collaboration with off-campus learning, the Whitman iMBA provides working professionals like you the flexibility of an online program with the benefits, networking and teamwork of on-campus residencies. With a history of innovation and leadership, the Whitman iMBA continues to provide you the opportunity to make your mark and advance your career. Our iMBA program offers the same curricular content as our full-time MBA program while emphasizing learning objectives for seasoned professionals. Upon completion, iMBA students receive the same Syracuse University MBA diploma as our full-time students. You’ll take two courses (six credits) each semester, allowing you to complete the iMBA in three years. The course sequence, totaling 54 credits—12 core courses and a broad choice of six electives—provides seamless progression within the three-year time frame. The Whitman iMBA brings a world-class business education to you, on your terms. This innovative online MBA program is designed to advance your career by providing the global business acumen you need, no matter where you live. Blending on-campus collaboration with off-campus learning, the Whitman iMBA provides working professionals like you the flexibility of an online program with the benefits, networking and teamwork of on-campus residencies. With a history of innovation and leadership, the Whitman iMBA continues to provide you the opportunity to make your mark and advance your career. Our iMBA program offers the same curricular content as our full-time MBA program while emphasizing learning objectives for seasoned professionals. Upon completion, iMBA students receive the same Syracuse University MBA diploma as our full-time students. You’ll take two courses (six credits) each semester, allowing you to complete the iMBA in three years. The course sequence, totaling 54 credits—12 core courses and a broad choice of six electives—provides seamless progression within the three-year time frame. Admission to Syracuse is competitive. Last year's entering class (for the full-time program) had an average GMAT score of 635, with a range of 610–660 and an average undergraduate GPA of 3.3. 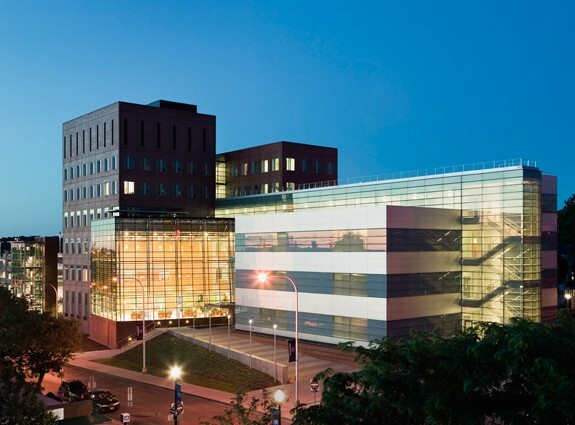 To apply to the accelerated program, students must have an undergraduate degree in business, a GMAT score of 650 or better, and four or more years of professi...Admission to Syracuse is competitive. Last year's entering class (for the full-time program) had an average GMAT score of 635, with a range of 610–660 and an average undergraduate GPA of 3.3. To apply to the accelerated program, students must have an undergraduate degree in business, a GMAT score of 650 or better, and four or more years of professional work experience. Reviews are made on a rolling basis and students are notified of their acceptance or nonacceptance within 4 to 6 weeks. Students at Whitman are a “very diverse group” of people, who “all come from different industries,” as well as varying academic backgrounds. With long-term goals and plenty of ambition, these “highly intelligent” students are “competitive and driven” when it comes to coursework and careers. Fortunately, that competitiveness does not negatively affect the academic environment. On the contrary, the atmosphere at Whitman is “very collegial and collaborative,” and students are “friendly, extremely helpful, and support­ive” of their classmates.“Syracuse’s full-time MBA group is very close,” described by some as “one big extended family.” On campus, “There is hardly ever a day that goes by when there isn’t an event, speaker, or sports activity that students can attend,” and “there are plenty of clubs and groups to join where you can mentor, lead, participate in the community and more.” In addition to events at the business school, MBA candidates can also take advantage of the resources on the greater campus, like “attending sold-out sports games and events fea­turing figures such as Hillary Clinton or the Dalai Lama.” Though “winter is long” and very cold, the medium-sized city of Syracuse is a comfortable hometown, with plenty of recreation and cultural events for students. For example, “The city of Syracuse has dif­ferent events going on every weekend in the summer. They have blues festivals, Irish fes­tival, and several others.” On top of that, the school is “near New York City,” allowing students to take advantage of the many social and professional opportunities in the Big Apple. Whitman’s emphasis on experiential learning is a boon to students looking to jump-start their career after the MBA. Plus, the school’s individualized focus makes it easier to prep for a successful job hunt. Here, faculty and staff “go above and beyond to ensure you are well prepared for your career, and customize plans to place you in your dream compa­ny.” Specifically, via the Whitman Career Center, students have access to professional-development workshops, personal coaching, and “strong networking events” with local companies. Particularly advantageous for those looking locally, “Alumni is set on creat­ing successful opportunities for current students.”While everyone agrees that “Syracuse’s MBA program is on the rise,” students would like to see more on-campus recruitment opportunities for MBA candidates, suggesting the school could improve by opening a “career center focused specifically and only on graduate students, (MBAs, master’s, and PhD students).” Fortunately, improvement is already in the works: students note that, this year, the school is “doing a great deal to bring more business recruiters and alumni onto campus for networking opportunities.” In 2014, Syracuse graduates had an average base salary of $72,119, with a range between $45,000 and $110,000. Top hiring companies include the Federal Reserve, Chrysler, Pfizer, KPMG, Ernst & Young, JPMorgan Chase, Intuit, and Lockheed Martin. Whitman is thriving! Business Week regards Whitman as one of the cream of the crop in its inclusion of MBA programs considered for their ranking. And Princeton Review ranks the Whitman among the "Best Business Schools." From opening our new Real Estate Center to launching the Orange Value Fund to our most recent grant to create a Women’s Business Center, Whitman is thriving!The Whitman School is proud to nurture graduates who want to develop as entrepreneurial managers who will become leaders in an era of global competitiveness and technological advancements. We do this in an environment that promotes firsthand experiences where students can hone their communication and interpersonal skills as well as their analytic and problem solving capabilities, giving our students a dynamic and relevant business education. The small MBA program at Syracuse University’s Whitman School of Management is a good fit for early- and mid-career professionals hoping to ramp up their business acumen and gain valuable experience in the real world. Academically, the MBA curriculum is well rounded, covering a wide breadth of subject areas, while also placing “emphasis on finance, supply chain, and entrepreneurship.” A great place to get your feet wet in the world of business, there is an “experiential component featured in many of the classes,” as well as myriad “opportu­nities given to MBA students to participate within different organizations, whether as an intern or as a consultant to a large reputable firm.” A current student adds, “These academic consulting engagements added depth to many of the courses through projects that provided and often required innovative and hands-on approaches.”Whitman professors are generally “productive and efficient,” with “excellent academic backgrounds” in their field of specialization. When it comes to leading a class, however, students say their skill set varies: “There are professors who are great, know their fields, and can quickly apply lessons to what is going on around the world.” On the other hand, “Many of the older faculty lacks presentation skills. Lectures can be very dry.” The upshot is that, across the board, professors are supportive and “willing to help on proj­ects outside of the classroom.” In fact, thanks to the “very small class size,” “you can get to know your classmates and your professors on a personal level.” At the same time, stu­dents love the fact that Syracuse offers all the “resources of a large institution,” includ­ing a “beautiful new building” for business students, replete with “up-to-date technology.”In addition to the traditional MBA, busy professionals have the option of enrolling in the well-regarded iMBA at Syracuse, “which combines actual on-campus learning via week-long residencies, along with online course work.” According to those in the program, “The iMBA program provides the same educational experience as the full-time MBA (same curriculum, professors, etc. ), but has a much more flexible format.” In addition, the school offers a “great JD/MBA program with lots of connections in NYC,” as well as a joint masters program in conjunction with the U.S. Army. Full-Time MBA The program offers students a rigorous and experiential two-year program that prepares them to become strategic thinkers and innovators in an ever-changing global economy. Students generally complete an internship in the summer between the first and second. Full-Time Accelerated MBA Students with four or more years of full-time work experience and an undergraduate degree in business from an AACSB International-accredited institution are eligible for the one-year 36-credit accelerated program. Independent Study MBA (iMBA) The iMBA is a limited-residency distance learning MBA program for executives that follows a unique flexible format combining in-person residency and online learning. A minimum of five years of full-time professional work experience is required for admission. MS in Accounting The MS in Accounting program aproduces graduates with the educational requirements needed to take the CPA exam in New York. An undergraduate degree in accounting is required for this one-year program. Independent Study MS in Accounting (iMS) The iMS program offers full-time accounting professionals a distance-learning program that prepares them to qualify for the CPA exam in New York. The program follows a unique flexible format combining in-person residency and online learning. An undergraduate degree in accounting is required for admission. Students in the MS in Finance program graduate from the rigorous, one-year curriculum prepared to manage the risks associated with operating in a global marketplace. An undergraduate degree in finance or economics is required for admission. Syracuse University's Newhouse School of Public Communications and Whitman teamed up to offer this program. Master of Business Administration (2 years); Independent Study MBA (iMBA) (2-7 years); Master of Science in Accounting (1-2 years); Independent Study MS in Accounting (iMS in Accounting) (2-3 years); Master of Science in Finance (1-2 years); Master of Science in Entrepreneurship (1 year); Master of Science in Supply Chain Management (1 year); Full-Time MBA, Independent Study MBA (iMBA), MS Accounting, MS Finance, MS in Entrepreneurship, MS in Supply Chain Management. Whitman is home to the International Business Association, a student club focused on international business and business student issues. Students are matched on an individual basis. Internship and study abroad opportunities are available in London (England), Madrid (Spain), Shanghai (China), Capetown (South Africa), Singapore, and Hong Kong. Whitman is home to the Women in Business student organization that brings to campus guest speakers and hosts events related to fostering leadership in women. Want more info about Syracuse University, Whitman School of Management Distance MBA? Get free advice from education experts and Noodle community members.